Football is a great game, but sometimes it just feels like there are too many rules. Wouldn’t it be great if you could strip the game down to the basics? Well, Colin Lane Games did just that with Touchdowners, a mobile title which incorporates crazy physics that make the game more fun. 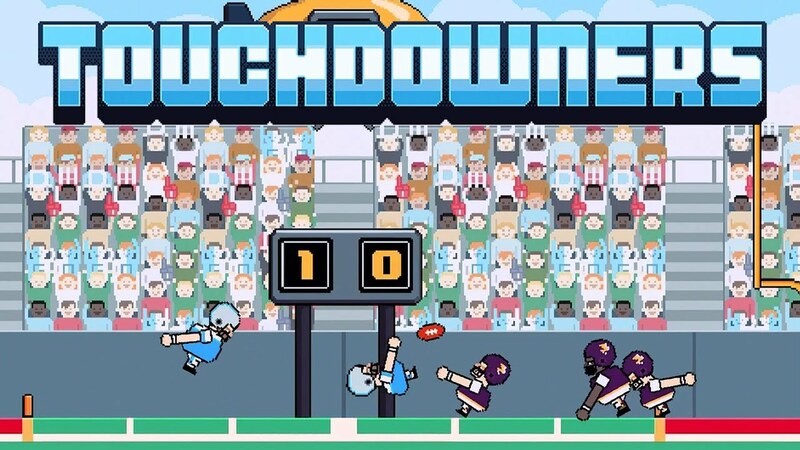 The basics of the game is that you control thre Touchdowners as they jump, run and pass, the goal being to reach the end and score a touchdown. The football takes place on a specific area of the screen while you try and move from one side to the next. The control mechanism is simple: there are arrows which assist them in running to the right or left. If you want to pass, just press the pass button. Sounds simple enough, but the challenge is their arms are always moving. What this means is you have to align the arms to make sure they’re able to grab the football. You have to control the movements so you don’t run over the ball and miss it. Just like in the real game you can intercept a pass or tackle your opponent and take the ball. So while Touchdowners isn’t a football simulation, it still has the basics and fundamentals so it feels like you’re playing the game. Touchdowners requires fast responses and reflexes, and that’s one reason why it’s so fun. It’s challenging yes, but the satisfaction you get when you complete a pass makes up for this.